FREE Home Depot Kids Workshop! My kids have been going since the beginning of the year! My son was 3.5yrs old and my daughter was 6 when we started (now 4 and 7!) and they LOVE IT! Above are some of the projects they have done this year, a Home Depot Truck, a Plant Stand and last Saturday they made a Minions scooter! It is messy, but a lot of fun! At the Home Depot we go to they have handed out candy at Easter and last week they handed out ice pops! It's happens the first Saturday of the month from 9am-12pm! We aim to get there between 10.30-11am as it is a little quieter, but its still busy! The next session is going to be Saturday August 1st and they will be making a chalkboard door hanger! They ask to sign up so they can make sure they have enough kits for all the kids! 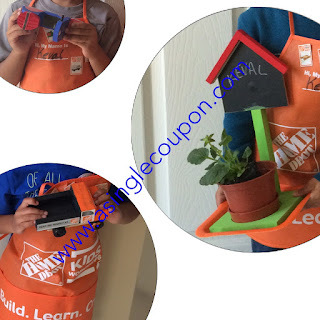 Sign up here >> FREE Home Depot Kids Workshop! Let me know how your kid's like it!